BRUNO, A CHEF-TURNED-HERO, WITH A DISH OF PASTA. A talent, used for serving poor children, that is changing his city…and not only that. 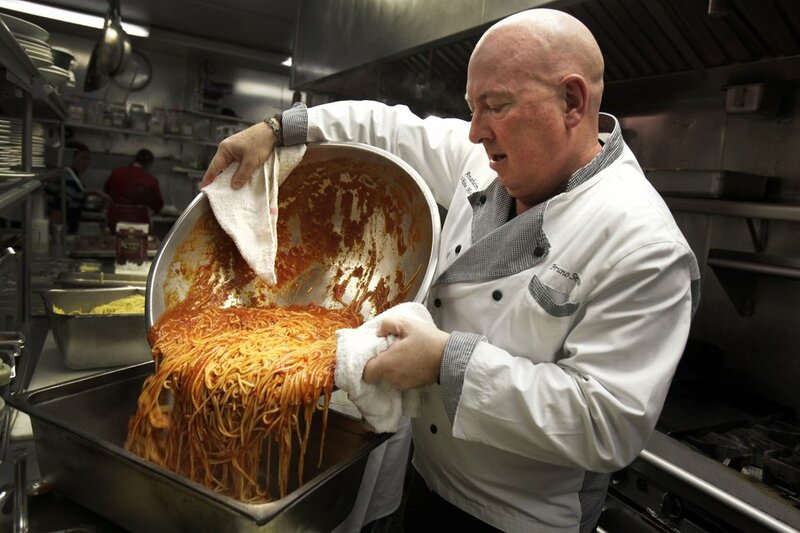 His name is Bruno Serato, a chef at age 55, from San Bonifacio, Italy. CNN has recently named him in the “Top 20 Heroes 2011”, the classification in which the American based 24-hr continual news network has for the past three years chosen 20 exemplary people who in their daily lives are changing the world. Moral Wings liked the story a lot. He is doing what we’re doing! His story first appeared in “People” magazine, then on the television news networks CNN and CBS. Then it was on the front page of the Italian newspaper, Corriere della Sera, on March 28, 2011 and then on Italian television news. Bruno left San Bonifacio, Italy, years ago to go to California to learn English. It was quite a challenge. He did not know the language and had to adapt. He started as a dishwasher, but eventually was able to open his own restaurant: the Anaheim White House. 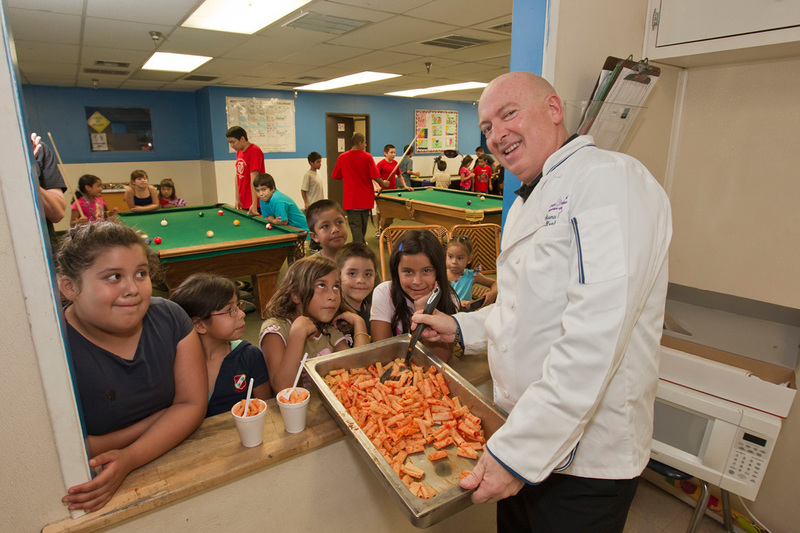 Every night for six years Bruno has fed the 300 children of the local Boys and Girls Club, a public facility for children. They are children who live in motels where the rooms cost a few dollars a night, in an environment surrounded by prostitution, drugs, and alcohol. Often parents do not even have the money to buy groceries. When his mother Catherine found out about the children’s condition, she told him: “Bruno, make them some pasta.” Since then he has spent an additional $2,000 dollars each month and each night has served up to 45lbs of pasta with fresh tomato sauce or white sauce, but never pesto…we wanted to know why, so we looked him up for an interview. Bruno is in Italy on vacation. We called him right before he went to dinner with his 15 grandchildren. Thank you for agreeing to share your story with Moral Wings. Tell us how you chose cooking as a career. I grew up in a poor family. When I was little, my parents immigrated to rural France to cultivate potatoes and beets. It was the simple life in the country. They were paid by how much they grew, the more bags, the more money they earned. Then, when I was fourteen years old, we returned to San Bonifacio and my parents opened a restaurant. My dad was a driver, my mom worked in the kitchen and needed help. I had to grow up fast. I had to learn everything: bartending, being a waiter, and helping in the kitchen. I discovered my passion! I decided to go to America to learn English so that when I returned I could earn more. When I came to America I had to start from scratch because I didn’t know the language. Since then I never turned back. As soon as I was able, I opened my own restaurant. I love everything about the restaurant business, from the kitchen service, to marketing to the selection of wines. I really enjoy talking with people in the restaurant. These days I spend more time in the dining room than in the kitchen. But I do the cooking for the children myself. You look like a normal person, with a normal job. Do you really feel like a hero? CBS network News says of you that in America you made a fortune and one day a voice told you that you had to share with others. This voice was not from above, but from Italy. What happened? Ehm… this thing I remember often… It happened about ten years ago… I was in my restaurant in Orange County and there was a customer. He was an Italian missionary from San Bonifacio, my hometown. He was a prudent person who would not let me offer him dinner. I said, “Since you’re from San Bonifacio, and you’re here in my restaurant, the least I can do is have dinner with you”. That evening as we chatted, I told him: “You know, I feel a bit guilty.” The missionary looked at me intensely interested and asked me: “Why?” I replied that I often ate fillet, caviar, and foie gras, while outside there were many poor people that had not even seen these things before. My new friend’s face lit up with an encouraging smile and he said firmly: “Bruno, God loves the rich. We only need to be able to give to the poor, to share what we have. If you can afford, you can eat fillet, just don’t forget those who don’t have anything to eat”. The light bulb went on! “You’re right!” I told him, “I’ve got to do something!” Those words had inspired me and made me feel lighter and freer. In my heart there was already the desire to help others. But I didn’t know how. Exactly … tell us about this recognition by CNN. You’ve been placed in the top twenty people who in their daily lives are changing the world? First of all, I dedicate the award to my mom, Caterina, who soon will turn 87 years old. Six years ago, in 2005, my mom came to visit me during her vacation. She saw some poor children who had a bag of potato chips for dinner and said, “They have nothing better to eat? Bruno, make them a nice plate of pasta.” I hesitated because there were nearly seventy of them. Then, I took courage and decided to act. Now there are 300, soon to be 400. But I’m not doing it all by myself. When you do the right thing it’s hard at first, but then it’s contagious. The customers of the restaurant often help by bringing me a package of pasta to feed the children. Others give me salmon, so I can make pasta with fish for the Omega-3. And some give me chicken or turkey, so children don’t eat only carbohydrates, but also protein. The children don’t like vegetables. If there’s green in the pot, the children don’t want it. This is why I don’t make pasta with pesto-ever. Sometimes I mix vegetables with tomato sauce, so that you wouldn’t notice. Otherwise I make white sauce. The children love it. You speak often of your family and how you’re going to eat pizza with your 15 grandchildren. Tell us about the importance of family and family values. Family should always be the center of your life. If they aren’t, the heart lacks everything. Family is the center of my life. Without my family, I’m missing my very heart. Family is everything. Family is love without conditions. To them, I’m not a hero. I’m just Bruno, and that’s all. You have a talent for cooking, and have found a way to make your passion available to others and with poor children in your neighborhood. How does this make you feel? I like to see people smile, to see customer satisfaction. To please others more than to please oneself, that’s what counts! Then to do it for the children…is worth a million bucks every time! It’s like winning the lottery. There is no comparison, this is the real-life lottery. Their thanks and their love is what makes the difference for me. When they call me “Uncle Bruno,” it’s the best feeling in the world. They know that even when they grow up, Uncle Bruno will always be here for them. Don’t listen to them! …Do what you feel inside of you. Don’t talk but act!! Talking, arguing, and sitting and waiting changes nothing. You have to act in your life, it’s the only way you’ll ever achieve anything. What advice do you have for those who cannot find the courage … what is the first step in your opinion? Like I said before …act! Get up in the morning and do something. Feed hungry children, go to a nursing home, take care of an elderly person, give him or her a glass of water, make him feel loved. Just do it! A simple gesture is important. Instead of walking with your head down without saying hello, act first, greet people, smile. It is not easy, but you have to do it. 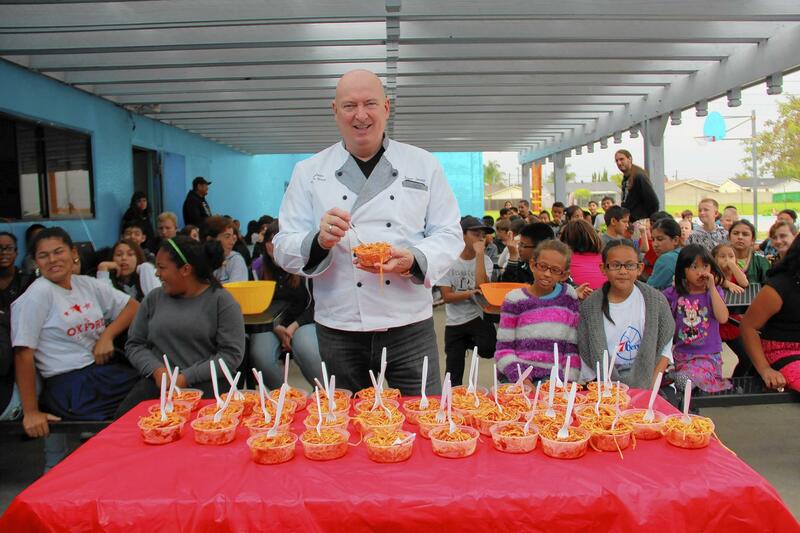 To change things you do not need to feed 300 children, start with one! But do something. Just do something. Something can be done. You can change the way things are. You just have to want it enough. Bruno, thank you for your example! Say hi to your kids. Enjoy your meal, buon appetito.